As a big fan of Chris Stapleton’s first band The Steeldrivers, Murray’s been spotted at numerous shows for the bluegrass outfit, including last November when he appeared at the Charleston Music Hall in South Carolina and bought all the remaining tickets for the show, handing them out to fans. Bill Murray has also been a huge fan of songwriter and reigning 2-time Americana Artist of the Year John Prine, recently participating in a video about how Prine saved him during a dark period in his life. 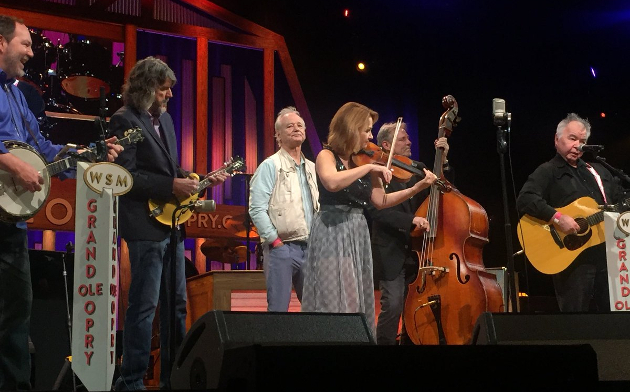 So when both Prine and The SteelDrivers were scheduled to play The Grand Ole Opry together Tuesday (9/25) evening, Bill Murray decided to make his way to Nashville to take it in, and take the Opry stage, even singing himself during Prine’s song “Paradise” as part of the segment. Opry attendees got a special treat as Murray sauntered on stage in a blue shirt and fisherman’s vest. It’s one of those unique moments the prestige of the Opry stage helps create. Afterward Bill Murray hung out backstage, taking photos with the respective performers on the night. Earlier in the week, Murray had been spotted at the Nashville airport, randomly helping people carry their bags. Bill Murray first met The SteelDrivers in 2010 when he played the part of a funeral parlor owner in the movie Get Low, starring Robert Duvall and Sissy Spacek. The SteelDrivers contributed heavily to the movie’s soundtrack, and that’s where Murray’s fandom was struck. I met a girl a couple years ago whose family lived close to him in Charleston, she said he would just always drive his golf cart around and randomly show up to events neighbors were having whether he was invited or not. Bill Murray is a national treasure and has been for a while. ………….what if Bill wasn’t Bill ?…..what if this was just a guy demonstrating this random , erratic behaviour he’s come to be known for …? would this not be some cause for concern ..? hmmm…just musing . I’ll crawl back to corner now . carry on . Just saying ….Bill gets to upstage John Prine because he’s Bill . Bill plays airport porter because he’s Bill……Bill does all of this random ‘crashing’ cause he’s Bill. If it were anyone else wouldn’t they be hauled away ? …lol. We’ve come to accept that Bill is ‘ out there ‘ but c’mon ….some of his behaviour has to have some people around him thinking WTF ..?.. What a treat for attendees.